Thyroglobulin is a 660 kDa dimeric pre-protein with multiple glycosylation sites. It is produced by and processed within the thyroid gland to produce the hormone thyroxine and triiodothyronine. Prior to forming dimers, thyroglobulin monomers undergo conformational maturation in the endoplasmic reticulation. The vast majority of follicular carcinomas of the thyroid will give positive immunoreactivity for anti-thyroglobulin even though sometimes only focally. Poorly differentiated carcinomas of the thyroid are frequently anti-thyroglobulin negative. 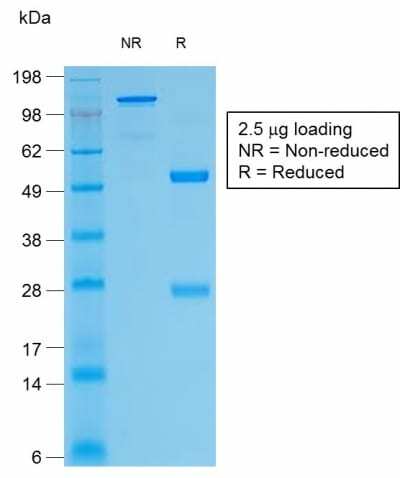 Adenocarcinomas of other-than-thyroid origin do not react with this antibody. 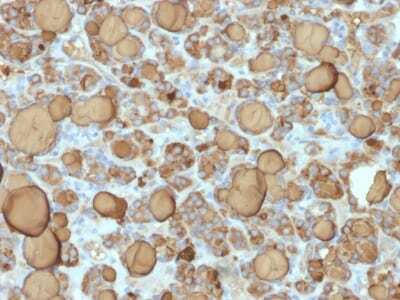 This antibody is useful in identification of thyroid carcinoma of the papillary and follicular types. Presence of thyroglobulin in metastatic lesions establishes the thyroid origin of tumor. Anti-thyroglobulin, combined with anti-calcitonin, can identify medullary carcinomas of the thyroid. Furthermore, anti-thyroglobulin, combined with anti-TTF1, can be a reliable marker to differentiate between primary thyroid and lung neoplasms. Catalog number key for antibody number 1968, Anti-Thyroglobulin (TGB/1968R) The prefix indicates conjugation, followed by the antibody number and size suffix. Ossendorp FA, et. al. Journal of Immunological Methods, 1989, 120(2):191-200.